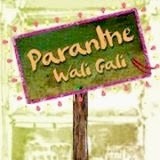 Debutant film director Sachin Gupta’s romantic comedy ‘Paranthe Wali Gali’ named after centuries old world famous culinary landmark of Delhi is all set to be released on January 17, 2014 across the nation. The film ‘Paranthe Wali Gali’ which depicts the vibrant rich culture and scintillating food flavours of walled heritage city of Delhi stars Anuj Saxena and Neha Pawar. The music of the film directed by Bangalore-based playback singer and actress Vasundhara Das, best remembered for her songs ‘Shakalaka Baby’, ‘It’s time to disco’, ‘Rabba Rabba’ and Vikram Khjuria (Two songs) was released in Mumbai earlier this week. The Lyricists include Vipin Mishra, Viraj Mishra and Devshi Khanduri. Singers are K.K.Joi Barua, Sidharth Basrur, Jasraj Joshi, Tejas Shankar and Vasundra Das. “Historical walled city’s lanes and by-lanes , its mannerism, culture and its cuisines have been my favourites since childhood, but ‘Paranthe wali gali’ has been always been my hot destination , my debut film named after this street will showcase the resilient and enduring culture and heritage of the area, which has withstood the test of time and remains as vibrant as ever” said Mr Sachin Gupta, Director and producer of the movie. The film has been named after Paranthe Wali Gali, Old Delhi’s famous by-lane known for its wide array of tempting paranthas, because the place is shown as a backdrop of the film. “The story of Paranthe Wali Gali starts from the famous and popular lane and then moves into the lives of the characters living there. In the film, we are trying to touch that part of Delhi that has not been explored till now.” The director added. “A romantic comedy, the film also has various other dimensions. It is a sensitive film of dreams, success, failure and relationship.”said Gupta. Till now, Gupta has done 13 original productions, three broadway shows in New York and he even recently got a National Award – Natya Bhushan – for his contribution to theatre. “It can be considered a romantic comedy, but not entirely. It has various other aspects too. It is a sensitive film and has such an appeal using the Old Delhi lanes and other symbols those easily recognisable monuments. Anyone would be able to relate to it. It would be about me or you or anyone else,” said Mr Gupta. The cast includes Anuj Saxena, Neha Pawar, Vijayant Kohli, Mohinder Gujral, and Prabhakar Srinet, mostly from small screen and theatrical background “Our attempt in the movie is to showcase the characters and not the actors. So I did not finalise A-list actors. At present if you see the kind of cinema made, having star does not matter any more,” said Gupta. The co-producer of the movies is Subodh Goel, Cinematographer Debashish Banerjee, Editor Vijay Chauhan.